Make sure that you have the latest demo revision: be sure to run Demo version 4.2 onwards. For Demo running on a resistive touchscreen, make sure that you use a sharp object such as a pen or stylus. In fact, it is the pressure on the touchscreen film that gives the location information to the SoC ADC controller. So, remember, a resistive touchscreen is manipulated differently than a capacitive one. When switching between screens (climate to lighting for instance), transitions might seem a little bit slow. This is actually an effect, a transition animation that is controlled by a timing (new screen is sliding from right to left). The default setting is 300ms for the transitions, done twice. If you have the feeling that screen transitions and widgets within the home automation demo are too long, you can modify these timings. 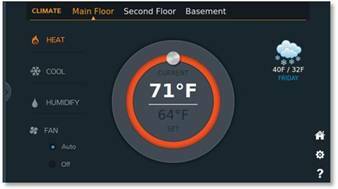 Temperature widget also comes with user configurable sensitivity. Default setting for this sensitivity is 2. 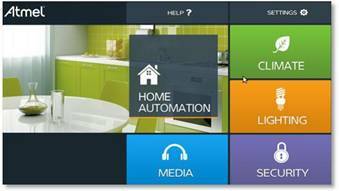 The Home Automation main menu is managed by the Application Launcher. You can easily customize this graphical menu by simply editing XML files. Background, number of applications presented, application icons and applications started can be modified using a text editor without re-compiling anything. The bin directory contains the main QT application which is called ApplicationLauncher. This application is launched by its associated script ApplicationLauncher.sh. When starting the board, This shell script is automatically launched at the system startup by the dedicated init script named /etc/init.d/qtdemo that follows the classical SystemV init procedure. The background image is managed by the Page.qml file located under /opt/ApplicationLauncher/qml/ApplicationLauncher folder. You can add another application to the screen by editing the applications_list.xml file located under /opt/ApplicationLauncher/resources folder. Adding another <entry> in the .xml file adds a new application button. The applications_list.xml file located under /opt/ApplicationLauncher/resources folder can be modified to change <title>, <link> and <path> properties. These modifications allow you to run the desired application, by clicking a different button image. 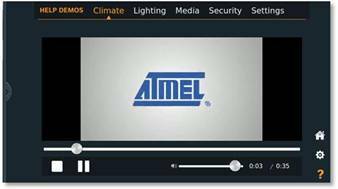 Atmel® and others, are registered trademarks or trademarks of Atmel Corporation or its subsidiaries. ARM® and others are registered trademarks or trademarks of ARM Ltd. Other terms and product names may be trademarks of others. Ideas, requests, contributions ? Connect to LinksToCommunities page.